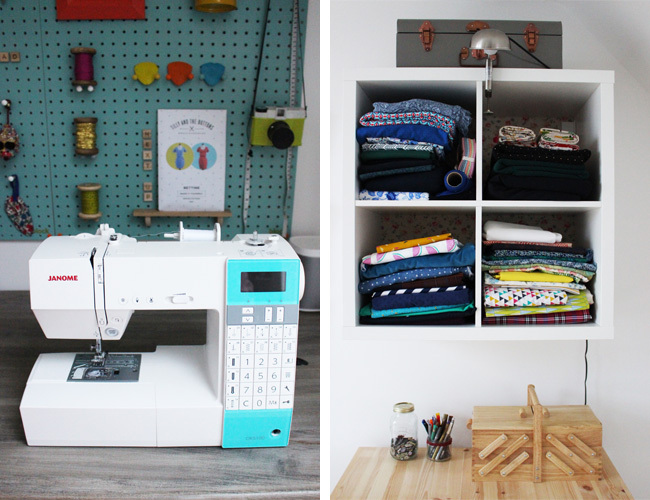 Tilly and the Buttons: Sewing Space Tours... Jen's Seriously Stylish Sewing Space! 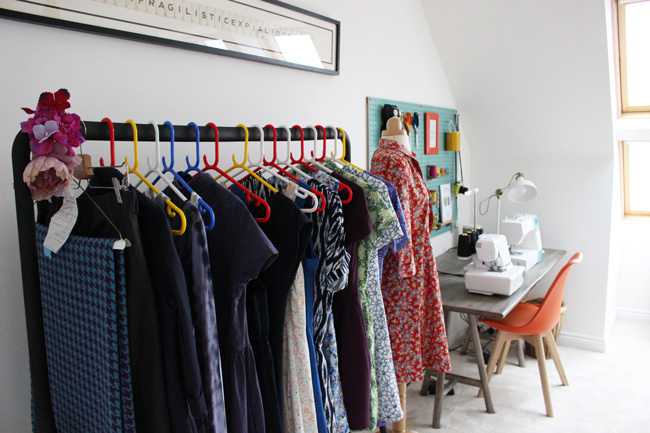 Sewing Space Tours... Jen's Seriously Stylish Sewing Space! 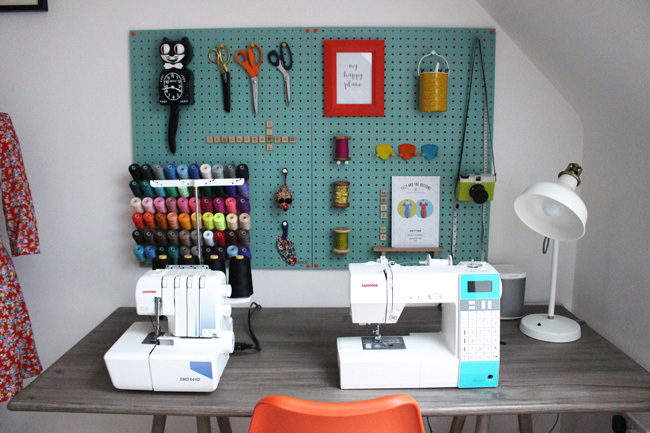 Hello sewing fans, I’m Jen, aka The Gingerthread Girl – and this is my sewing room! I am found here at any spare minute when I’m not at the day job, usually accompanied by my fluffy cat, Frankenstein. This is the spare room at the top of our house, which I cannily negotiated for a dedicated sewing space in negotiations with my husband when we bought the house just under a year ago. 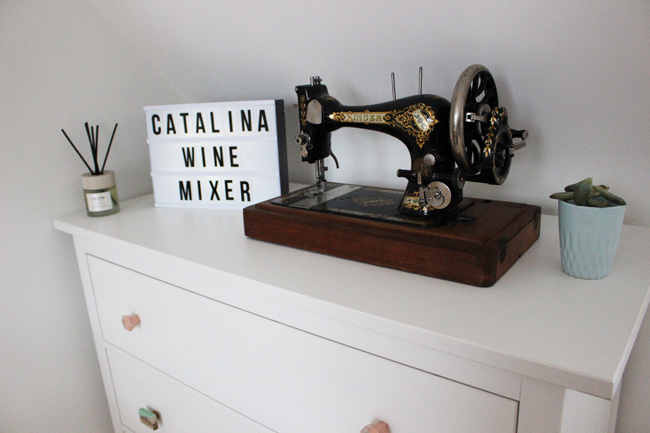 I knew as soon as we looked at the house layout that this room would be perfect as a sewing room, with all of the gorgeous natural light which floods the room through the roof windows. 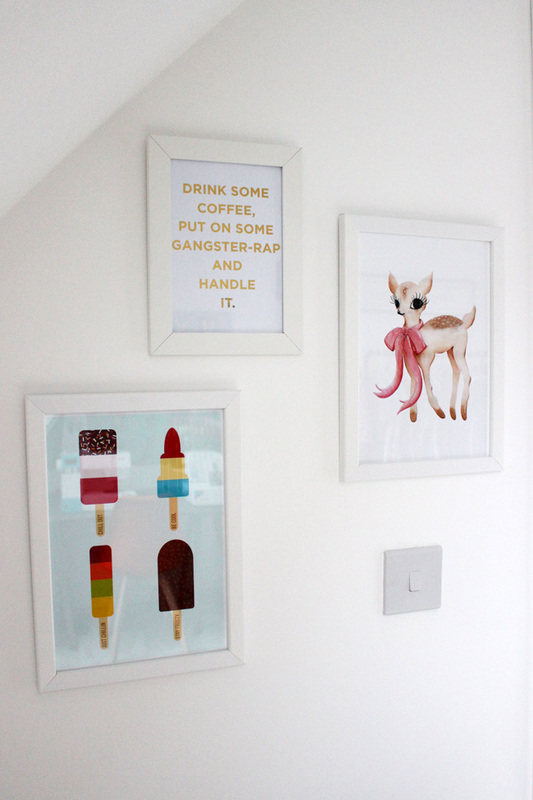 Our house is a new build, so we have been restricted with painting and decorating for the first year, so I knew straightaway that I would be styling the room with splashes of colour in the features that I put in there. 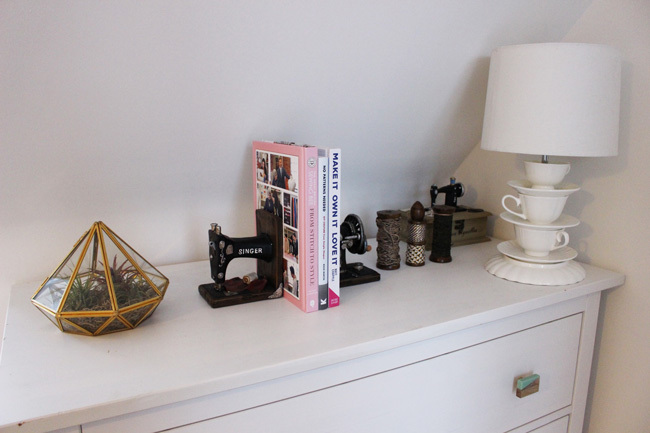 When I first started furnishing the room I spent most of my life on Pinterest, collecting lots of sewing room ideas. 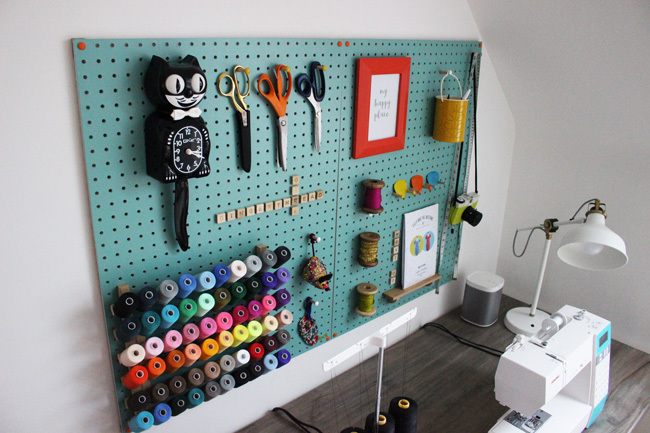 The first thing that I knew I absolutely had to buy was a pegboard. And I have to say, this is probably my favourite feature in the room. 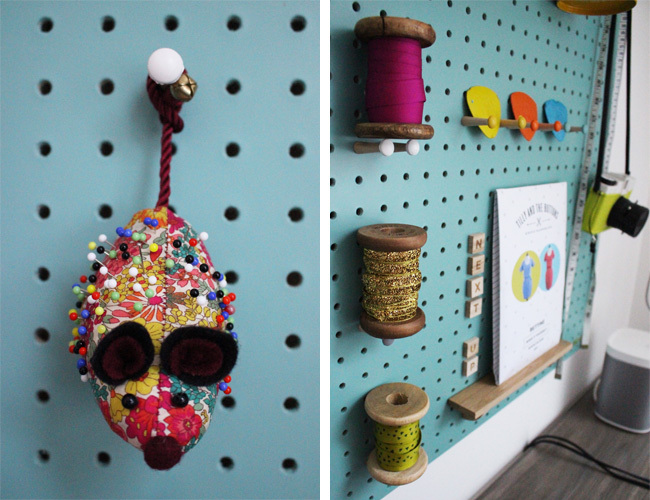 I have since styled it with a thread rack, Kit-Cat clock and hanging space for all the essentials. I had to be a little bit creative with pegs – using them for makeshift shelves for spools of ribbon and hanging chalks. I even had to hang my Liberty mouse pin cushion from his tail! But I think he looks kind of cute. Next purchases after the pegboard were my lovely wooden trestle desk to sit my Janome sewing machine and overlocker on. After that I raided Ikea for the big drop-leaf cutting table, book storage, as well as chests of drawers and the clothes rail. I absolutely love Ikea for fantastic storage solutions! I already had the square wall-mounted unit for fabric storage, so kept this from my old house. 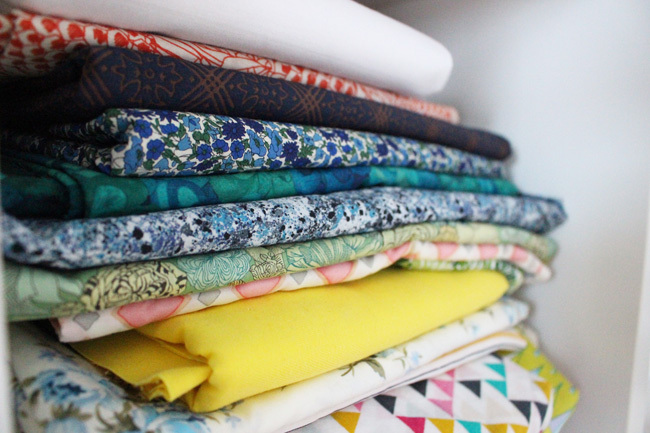 The huge cutting table is especially handy for spreading out with fabrics and dressmaking patterns. 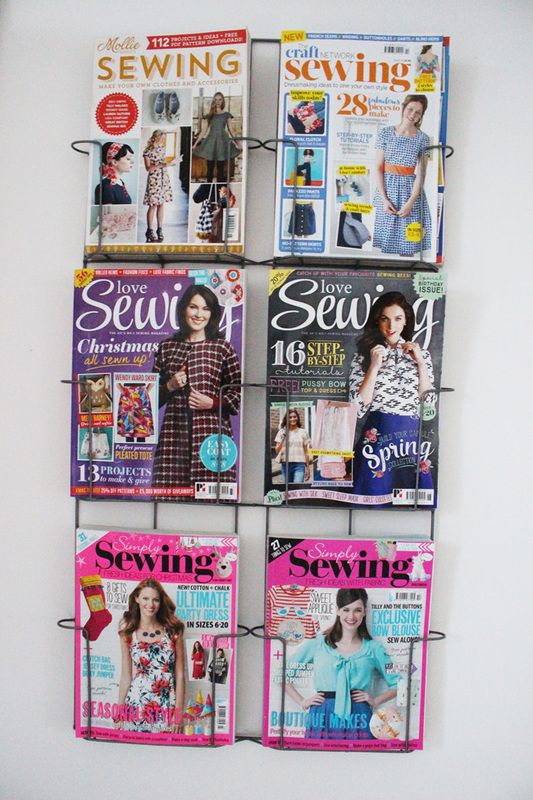 Other features that I love are the magazine rack (otherwise I am so messy and overrun with sewing magazines! ), vintage suitcase for stashing offcuts of fabric and the old Singer sewing machine. It’s so pretty! I also get a lot of use out of my Sonos speaker, to play my music while I’m making. It helps me to get in the zone! 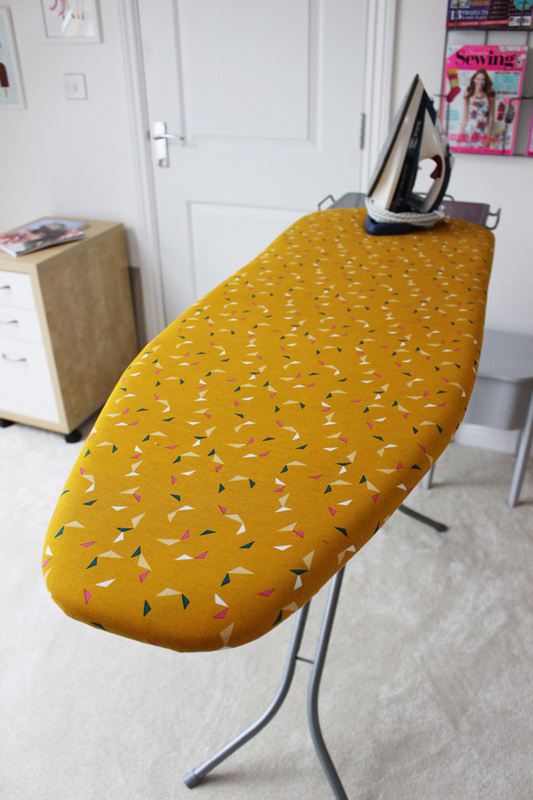 I recently jazzed up my ironing board with a new ‘me made’ ironing board cover. For this I used a tutorial from the Tilly and the Buttons blog, and some remnant fabric bought from Backstitch. It has turned out brilliantly! 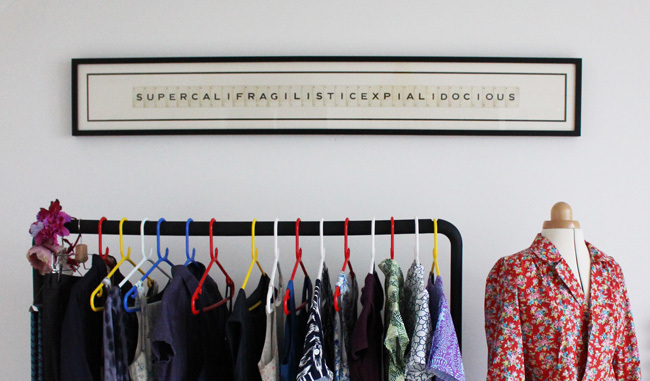 For adding a bit of fun to the walls, I bought some fun prints from Etsy and another of my absolute favourite elements in the room is the framed ‘Supercalifragilisticexpialidocious’ made from vintage playing cards. 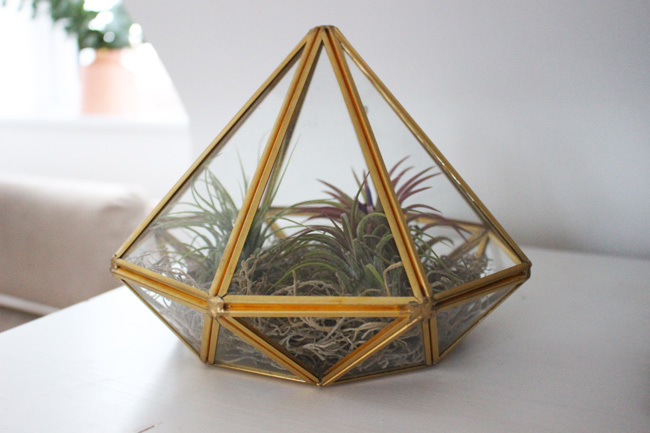 I had been eyeing this up in my local Oliver Bonas store for so long. After going back to the shop around 5 or 6 times to stare at it, I eventually gave in! And I’m so pleased that I did. Then to finish off the room I added some succulents and air plants, a couple of fun and random cushions, and obviously a cinema lightbox! The end result is a room which I would probably best describe as my little slice of heaven. 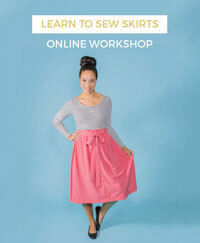 In here I can escape traumas of the world and feel inspired to be creative with my dressmaking. I have tried to make this space as practical as it is pretty, and think I might have just pulled it off! I hope you agree! Thank you so much Jen for finishing off 2016 with such style! Please can we hire you to make our places just as stylish?! Do you remember Lisa's Yurt, the first in our series, back in January 2016? Go and check out (or revisit!) 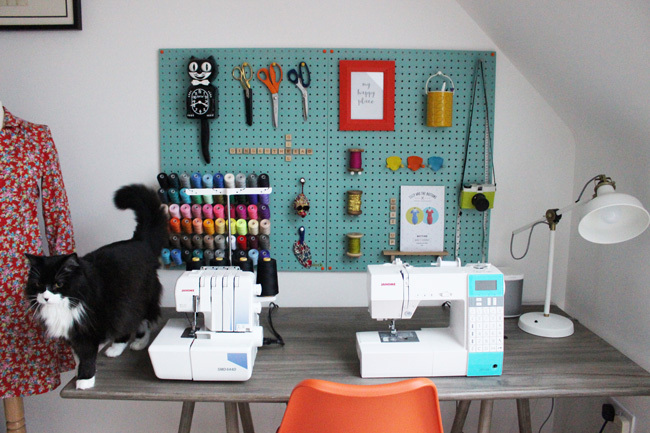 the other spaces in the series for a heavy dose of sewing space inspo. 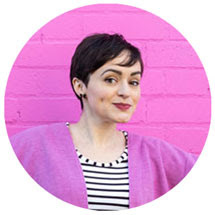 Would you like to see your space on the blog? Check out our submission guidelines.